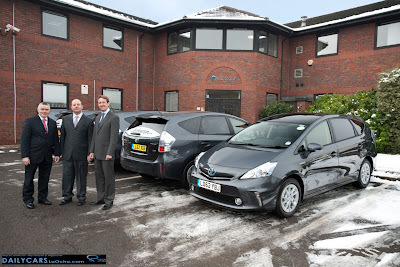 Embarque, the new executive minicab service operating in London and all the major airports will be transforming its vehicle fleet by adding 22 seven-seat Prius+ models through January and February. Already operating a fleet of vehicles with uniformed drivers 24 hours a day seven days a week, Embarque is a sister company of Carey Worldwide Chauffeured Services, who provide premium chauffeured services in over 500 cities worldwide, and a pioneer of the chauffeur industry since 1921. Embarque has set itself a responsible agenda to minimise all aspects of their business impact on the environment. A carbon neutral company, they invest in two projects around the world to eliminate the effect of CO2 from their fleet. At Embarque’s head office in West London, 30 per cent of their electricity is sourced from wind farms using Ecotricity, and a strict Reduce Reuse Recycle policy operates for all office consumables in conjunction with Greener World Recycling. The Embarque service is also available in major US cities, where Toyota hybrid vehicles are already a key feature in their service. This focus on the environment includes a procurement policy designed to research new products relating to fuel efficiency which meet their needs. The recently launched seven-seat Prius+ with CO2 emissions of 96 g/km and combined fuel consumption figure of 68.9 mpg (in T4 grade) has met these requirements. Using efficient Lithium-ion batteries located between the driver and passenger, Prius+ does not compromise on boot space and as a full hybrid is able to operate solely on electric power at lower speed meaning no fuel is used and zero tailpipe emissions. Prius+ is able to help any fleet reduce CO2 emissions and with almost zero emissions in NOx (Nitrous Oxide) and PM (Particulate Matter) which affect air quality, able to reduce these harmful substances that affect human health. All the vehicles are grey T4 grade models, supplied by Currie Motors Business Centre in Twickenham and financed through Toyota Financial Services. Standard features include cruise control, automatic air conditioning, Heads-up display and panoramic roof with automatic sun shade.